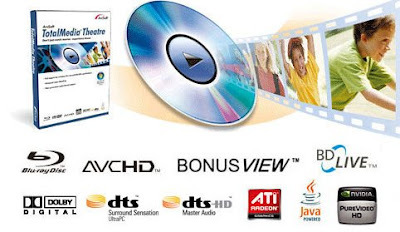 ArcSoft TotalMedia Theatre Enhance your movie watching experience with tons of cool features and options that you just can’t get from a standard DVD player. With a stylish, intuitive interface that makes it easy for beginners, and a wide assortment of advanced options that video enthusiasts crave, ArcSoft TotalMedia™ Theatre does everything but pop your popcorn.Universal Player, including Blu-ray. In addition to playing commercial and homemade DVD movies, TotalMedia Theatre plays Blu-ray discs, AVCHDs, CDs, VCDs, and a variety of multimedia files, including QuickTime, RealPlayer, DVR-MS, WMV HD, and H.264 HD videos.